The U.S. Department of Justice building in Washington, D.C.
SAN FRANCISCO (Legal Newsline) - Three weeks ago, defense attorneys for FedEx Corporation pulled off the unthinkable, having a case brought against the company by the federal government over allegations of transporting illegal prescription drugs dismissed by a federal judge. Nearly two years ago, FedEx was indicted by a federal grand jury in San Francisco for its alleged role in distributing controlled substances and prescription drugs for illegal Internet pharmacies. 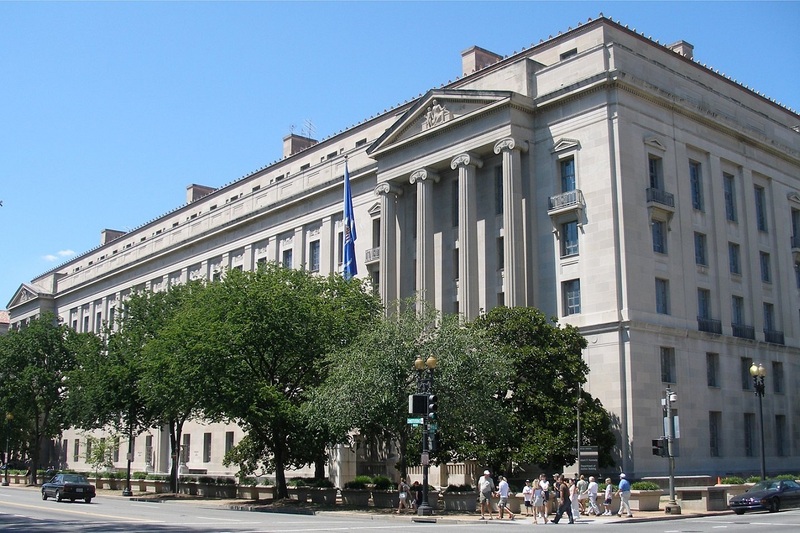 The U.S. Department of Justice charged the Memphis-based global courier with conspiracy to distribute controlled substances, conspiracy to distribute misbranded drugs, distribution of controlled substances and misbranding drugs. Its Atlanta-based rival, United Parcel Service Inc., was similarly charged; however, UPS agreed to settle with the DOJ for $40 million in 2013. The bench trial, which began June 13, came to an abrupt end that Friday, June 17, following detailed opening statements by both the DOJ and FedEx. “I am deeply concerned with the tragic consequences caused by the sale of controlled substances to individuals, including children, who have not had an in-person and direct consultation with a licensed physician,” Breyer said in a statement, which he read from the bench in approving the dismissal, according to The Washington Post. “It is my hope that the convictions in previous cases and imprisonment of those participants has discouraged others from engaging in this process. Breyer said FedEx did not have criminal intent. “To the contrary, they offered to and did cooperate with the Government during the course of its investigation,” the judge said. “As FedEx said to the DEA from the inception of this alleged conspiracy and repeated over time, ‘Simply identify a particular customer who is shipping illegal substances, and we will not pick up or deliver his packages.’ DEA was either unwilling or incapable of providing that information to FedEx. Patrick Fitzgerald, senior vice president, marketing and communications, for FedEx, said in a statement that the company “is and always has been” innocent. “The case should never have been brought,” he said. “The government should take a very hard look at how they made the tremendously poor decision to file these charges. Many companies would not have had the courage or the resources to defend themselves against false charges. The company said it remains committed to its long-standing cooperation with law enforcement authorities to prevent misuse of its transportation networks. The only statement provided by the U.S. Attorney’s Office -- late that Friday -- confirmed that it moved to dismiss the indictment and that Breyer granted the motion and dismissed. Abraham Simmons, a spokesman for the U.S. Attorney’s Office, said there have been no public statements about the reasons for the dismissal and the office could not provide one, even now, weeks later. In his statement, Breyer suggested the decision to dismiss the charges may have been a result of a change in attorneys. “While the Court is critical of the decision to prosecute, it wishes to commend Government counsel, especially John Hemann, who was not part of the original decision to prosecute and who now seeks dismissal of these charges,” the judge said. Melinda Haag, who originally brought the case against FedEx, left the U.S. Attorney’s Office last year. After a six-month sabbatical from public life, she returned to private practice in March. When asked by Legal Newsline about the case, its dismissal and what made her ultimately leave the public sector, Haag declined to comment. According to her bio on the Orrick Herrington & Sutcliffe LLP website, she is working in its San Francisco office in the White Collar and Corporate Investigations Group. Haag also was responsible for the DOJ’s case against UPS and a case against Pacific Gas and Electric Company. The criminal trial against PG&E got underway last month, with opening statements held the same day Breyer dismissed the case against FedEx. In 2014, a federal grand jury returned a superseding indictment charging PG&E with obstruction of the investigation of the National Transportation Safety Board, or NTSB, as well as additional violations of the Natural Gas Pipeline Safety Act of 1968, or PSA. The superseding indictment alleges that PG&E obstructed the NTSB’s investigation that began immediately after the deadly San Bruno explosion. The explosion occurred on Sept. 9, 2010 in the San Francisco suburb when a 30-inch diameter steel natural gas pipeline owned by PG&E exploded into flames in the Crestmoor residential neighborhood. Eight people died. According to the indictment, during the course of the NTSB’s investigation, PG&E provided a version of a policy outlining the way in which PG&E addressed manufacturing threats on its pipelines. PG&E later withdrew that policy claiming it was produced in error, and was an unapproved draft. PG&E was operating under the so-called unapproved draft from 2009 through April 5, 2011. Prosecutors argue the consequence of this practice was that PG&E did not prioritize as high-risk, and properly assess, many of its oldest natural gas pipelines, which ran through urban and residential areas. The superseding indictment also charges PG&E with 27 counts of knowingly and willfully violating the PSA. The company has pleaded not guilty to all charges. If convicted, it could be fined up to $562 million. When Legal Newsline asked the U.S. Attorney’s Office whether it believed its case against PG&E was stronger than its case against FedEx, it declined to comment. Simmons said the two couldn’t be compared. While the cases are notably different, the defendant companies have taken a similar approach: fight. Both FedEx and PG&E, unlike most corporate targets, have refused to settle. According to a 2015 article entitled, “Refusing to settle: Why public companies go to trial in federal criminal cases,” written by Gibson Dunn & Crutcher LLP attorneys F. Joseph Warin and Julie Rapoport Schenker for the American Criminal Law Review, in general only a very small number of corporate prosecutions involve trials, as more than 90 percent of prosecuted corporations plead guilty. “Companies frequently seek to avoid trial for several reasons, including the nearly strict liability of corporations for the actions of their employees and the fear of an Arthur Andersen-style ‘corporate death sentence,’” they wrote, nothing the demise of the former “Big Five” accounting firm that surrendered its licenses to practice in the U.S. after being found guilty of criminal charges relating to its handling of the auditing of Enron. “Some attorneys have argued that ‘[t]he low threshold for corporate criminal liability… combined with the threat of being debarred or excluded from contracting with the federal government upon conviction, has all but closed the criminal courthouse door to sizable corporations in the United States. FedEx stood firm from the start: “We will plead not guilty. We will continue to defend against this attack on the integrity of FedEx,” Fitzgerald said about a month after the company was indicted. Calling San Bruno a “tragic accident,” PG&E is confident the charges filed against it are not warranted. “... Even where mistakes were made, employees were acting in good faith to provide customers with safe and reliable energy,” it said in a statement the same day the superseding indictment was returned, in 2014.